Lots of mixed feelings on this Supernatural-based novel. It wasn't bad, especially for being a spin-off from a tv series, yet was far from impressive. The best paranormal-hunting brothers are always worth reading about. **Warning if you have not seen at least the first 2 season of the tv series, this review may contain spoilers for you**This story takes Sam and Dean to Key West. It takes place during the tv series' season three. Dean is trying to live up his last year, Sam wants to find a way to save him. This is one of the greatest positives for this book. I loved knowing when this takes place in the timeline. There is a lot happening in this novel. Ancient evil, demons and ghosts! While parts seem like it could make a good episode, there is a bit too much happening to make it work. And a fair share is left unresolved. This is also quite cheesy. Just like the show has some light-hearted episodes (such as Yellow Fever), this goes right along. Yet it tries to toss in the serious aspect with Sam wanting to help Dean out. Bit of messy confusion as to how to perceive the focus. Especially being as I didn't get that strong relationship feel between the brothers here. Way too casual with the mix.I did enjoy the Hemingway ghost stop. And all the cats!! Craziness! But very fun to read about. I suppose I now have a slight reason for visiting Key West myself one day! Much like the first two tie-in novels I read, this one was a good way to pass the time, although it's nothing spectacular. I did like the case the boys were working, and the way the author really fleshed out Key West and the people you'd see there. I also felt like the boys were more in character than the previous two installments, which was definitely a good thing; with a show like Supernatural as your basis, you kind of need the characters to sound like the characters you see on TV! I also liked the appearance from Bobby, and the nods to the season this is set in (season 3), particularly Dean's looming trip to hell. All in all this was a solid story, and definitely the best of the three tie-in novels I've read so far. 1.5A combination of a potentially great story and complete cheesiness in the end.The potential is in 'the mysterious ancient power looking for revenge'. Though it is dubious how evil that power is, it could have been a great story. Until the cheese fest near the end of the book. It got so bad that I was embarrassed. Čekala jsem, že tato knížka nebude nic světoborného... Vlastně jsem myslela, že bude opravdu hrozná, ale k mému překvapení to nebylo TAK hrozné. Ano, je tam spooooouuuusta zbytečných věcí, věty, které by Dean ani Sam nevypustili z pusy, ale kol a kolem je tato knížka dobrá, když není co jiného číst. There are a few reasons why I gave this book such a low rating, despite being a supernatural book with a decent enemy. *NO PLOT SPOILERS* 1. The use of certain phrases in conversation that Dean or Sam would never use. 'lockpicking skillz' (yes with a z) and 'emo' were used in normal conversation way too much. What they would say didnt always feel like their character (to be far most of the time it was ok). 2. Horrible, annoying and long back stories. An entire chapter to just say another person died. And it wasnt just once. The first 5 chapters werent of much use, and there were more back stories of ghosts towards the end. *slight spoiler* (And seriously what's the the girl who was being sexually harassed by her step brothers but her mom just said 'boys will be boys' and she played it off like nothing? Seriously that pissed me off and yet it had nothing to do with the story). 3. I was confused for half of the book because of misleading sentences (and again because an entire chapter at a time wouldnt be relevant). For example, "... didnt start off planning to kill tourists" - so reading this quickly you may establish that this is the killer, but it turns out the girl just didnt like tourists when she thought she would like them. So I went an entire chapter with her being the killer in my mind.If you do read this book, it wont be a total waste of time...the actual plot was good. I really liked the idea behind the enemy of book and how it was defeated. I tend to be very picky when it comes to reading the Supernatural novels, because like most books that are based on a TV show, they can be pretty bad. So before I read one I read as many reviews as I can. This one surprisingly had pretty good reviews and I'm not sure why. I ended up skipping Nevermore because it was reviewed poorly and read Witch's Canyon first. Which I enjoyed it was fairly spot on when it came to the characters and the story was entertaining. I should have realized when picking up Bone Key that it was written by the same author that wrote Nevermore. That being said, Bone Key was not very good. The story was rather interesting and creative but that wasn't enough to redeem it. First off, the characters, if you are going to write a novel based on TV show it would be beneficial to research the characters enough so that you know exactly how they act. The Dean and Sam in Bone Key were not the same as in the show, they said and did things that they would never do. And for some reason the author loved using the world "emo" which was just very out of place in the supernatural world. And lastly, even though the story was creative, it wasn't supernatural, I know it sounds weird but it was too much. I know I shouldn't expect much from these books but they are fun to read when I'm feeling like I need more Supernatural outside of the show. But in the future I plan on skipping any other ones that were written by this author. My quest to become a genuine Keith R.A. DeCandido fangirl continues today with his second Supernatural media tie-in novel. I enjoyed this one a lot more than his first, Nevermore, for a variety of reasons.While I thought he did an okay job in Nevermore of capturing Sam and Dean's characters, I know that was a major complaint of other readers. Their representation in this novel felt a lot smoother -- honestly, as if the author just didn't try as hard. The addition of Bobby as a secondary character was a welcome surprise, and while I thought his appearance at the end was a tad contrived (though necessary for point of view purposes), Bobby's voice was spot-on.The author's familiarity and love for Key West show through the words and description, and it's always very cool to see the brothers in an environment that's not a Midwestern small town with a vague resemblance to Vancouver. I also really appreciated a seeing mythology that wasn't based in generic Judeo-Christian stereotype. At the same time, this Native mythology was well-research, far from generic, and most importantly, felt respectful (despite being the villain). (I am not an expert, so your mileage may vary.) Some of the interlude scenes tilted just on the edge of dragging on too long, and didn't always feel especially relevant at first. But overall, this was a fast (and fast-paced), enjoyable visit with the Winchester brothers. Ah, this is more like it! Sam and Dean go down to Key West to hunt ghosts. what's not to like?I liked this book better than "Witch's Canyon", because the story was more what I had expected from these kinds of books. Where "Witch's Canyon" just introduced tons of OCs seemingly without direction, Bone Key creates OCs, people you get to know and who actually play a part in the things that are about to happen. And there's tons of things going on, starting with Sam and Dean going down to Key West, tons of ghosts, including Hemingway (and maybe some cats) and a honest-to-god doll (Chucky! The Killer Puppet! *evil laugh*), demons, more ghosts, salting and burning and Dean flirting in bars, and just generally tons of supernatural fun. Yep, I liked it.Now, I know that some have criticized the inaccuracy in the book, the voices sounding a little off, Dean's eye color etc., and you are right about those things. It's just that I can easily overlook them in favor of the story. I have my own version of these characters in my head, I know what they look like, I know how they act - so if the book is slightly off on these things, I just don't notice, because I really didn't care about the author's version of Sam and Dean in the first place, since I like my own just fine. I mean, if you were really looking for good SPN fic with amazing characterization, you'd go looking at fanfic, right? You don't expect these kinds of things from a tv-tie-in, do you?Anyway, these are just details, most of the book is well-written and in character, so if you are a Supernatural fan, I would recommend this book to you without hesitation. 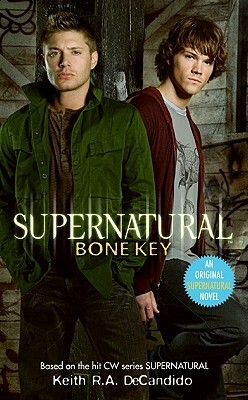 This would be 4 and ½ stars, but since that rating isn’t possible, I will lower it to 4.“Bone Key” was pretty much like its fellow books, “Nevermore” and “Witch’s Canyon”; full of light teasing between the brothers Dean and Sam, little hints towards the TV show (some bigger than others), and action mingled with light but solid story-telling, which keeps your nose glued to the pages and doesn’t make a dull read on the worst of days.As a story, “Bone Key” is traditional Supernatural quality. The theme deals with ghosts and spirits and a lost tribe’s vengeance, and beneath it struggle the forces of good and evil; Dean has less than a year to live because he traded his soul to keep Sam alive, and Sam has a problem with that. Also, the brothers have to deal with the possibility that they may have to work with a demon to outcome their current problem – which naturally isn’t an easy decision for any Winchester.In my opinion, while “Bone Key” is a brilliant, nice, fun-to-read book, it lacked a little bit in what the previous books had. Maybe the action wasn’t good enough, or the climax of the story. Perhaps the job was so ordinary that it didn’t stand out among all the other books and TV episodes.A definite must read to anyone enjoying the show, though. The plot and the spirit of the story are good, just lacking a little in intensity. While I like the idea behind this, it just didn't come together very well. Part of the problem may have been that there were too many viewpoints from characters that usually had no other purpose than to die. A few of these would have been fine, but there was more than enough. The characterizations of Sam and Dean were on maybe half the time -- maybe -- though I'd venture closer to forty percent. Bobby fared better after a somewhat strange beginning. Some of the dialogue was so badly worded I couldn't imagine either of them saying what they did, or using such poor grammar in one sentence, even Dean. Now we get to the word 'gonna.' Would it kill anyone -- anyone! -- to say 'going to' every once in a while? Or is there some kind of curse that will give them continuous diarrhea for a year if they do? That really started setting my teeth on edge after a while. There was one passage from Dean that was particularly painful and I wish I had kept the page number so I could have typed the passage out for posterity. I can't say the book was horrible, but it wasn't good either and it's definitely the worst out of the first three Supernatural books. This is my second-read Supernatural book and I enjoyed it even more than the first. Granted, I disagree with the characterizations of Dean and Sam (and Hemingway for that matter). But I thought the Key West location was well done and the plot was very Supernatural-esque. (Although I agree with other reviewers, what's up with leaving the job unfinished?) Also, the whole stinky thing? Why are the brothers being portrayed as clean-adverse?I am thinking the Supernatural book series needs a FEMALE writer. Who's with me on this?Maybe I'm being sexist, but I think female writers portray the slash relationship between the brothers better, and would give more insight into why they are attractive - e.g. to us Dean is a Wounded Hero not a slutty jerk. This is actually the fourth book from this series that I've read and I think it is so far my favorite. The voices of Dean, Sam, and Bobby were done well enough that one could actually see them being said. The characterizations of Dean and Sam were well done and not out of sorts. This takes place in the 3rd season and the author dealt with Dean's mixed feelings of his impending doom well and much like was seen on the TV series.The other characters that were introduced were well written and interesting and I certainly have to say the main villain turned out to be a nice inclusion although the finale with the one demon was a little anti-climatic. That and the tiny little issue over both of the boys having the same colored eyes weren't enough for me not to have liked this book. How does a writer with so much experience crank out such a lousy novel? Especially when he has the Supernatural universe to play around in! Terrible plotting, dull pacing, painful dialog, and cheesy humor run rampant throughout. I know it's just a TV tie-in novel, but still. Sam and Dean come across as being incompetent, and it's a major plot hole of the book that they didn't get killed at some point. And what's up with all the lame attempts at comedy? And running into the ghosts of Harry S. Truman and Ernest Hemmingway? If this had been a TV episode, people would say that the series had jumped the shark. I think that Keith R. A. DeCandido is my favorite author when it comes to the supernatural book series, he is funny, easy to read, and hard to put down. I also love that he includes a music list that goes along with his books along with a placement for his books within the supernatural tv. That not only get me engaged in the books using my love for the tv series but, also it helps to know a little back story without reading an annoyingly long prologue.This was a great story placed in Key West, Florida where Demons and Ghosts have come together to cause a little trouble for the tourist and locals. You even get a little bit of Bobby action in this one! This book got fairly close to reading like an episode of Supernatural. Dean, Sam and Bobby are in character and react to things the way I expected. I was a bit disappointed at the pacing and the method of defeating the bad guy. The pacing couldn't be helped because an episode of Supernatural goes much faster than any book could. Beating the bad guy though was a bit more deus ex machina or out-of-character or something than I prefer. It would have been better to have some kind of spell or something. I did like that neither Sam nor Dean are portrayed as stupid or lame or semi-evil the way some fanfiction sometimes does. They both save the day just like they are supposed to. This was a good book if you are a fan of the show. I don't think it would make much sense to someone who has not watched the series, and it wouldn't be very enjoyable. Some mis spellings, and an annoying use of Z in place of S. For example "skillz" instead of "skills". Overall a good read for a fan. I just love supernatural! I actually really enjoyed this book. It read just like an episode of the show(not one of the most amazing episodes but a good one none the less). It would be interesting to actually see this book as an episode. Like to see the boys have a little fun in the sun in Key West. Also liked to see that they got to talk to one of the spirits , and develope a friendly relationship somewhat, with them.It wasn't quite as funny as the other books, but still a good read between between series breaks. Good book, but I liked the other 2 better...towards the end it got a little "out there" even for Supernatural standards. It was exciting and I blazed through it in one day. The way they introduced the other ghosts was really cool, and I liked the addition of Hemingway. Very cool. Absolutely loved it. Want to read the next book in the series. i loved this book. it should have been an episode for sure. that would have been awesome to see. This book is certainly a few steps up from Nevermore, which was a book in this series written by the same author. I even liked it a bit better than witch's canyon, mostly because that book was a slow-paced one where only the ending was really entertaining. I do honestly think that DeCandido does very little research even though he pretends to do a lot.What I also noticed was that in Nevermore, DeCandido called Dean's eyes blue. He now came back on that by making Dean think he didn't know why people always thought his eyes were blue, since they were "clearly hazel". Nice try there, man. Wrong again. (I actually thought that was pretty funny. )If anything, though, his description of Key West was pretty vivid. It made me want to go there. I even ended up googeling the island to see if it was kind of like it was described in the book.I'd say this is a pretty good "fanfiction", but like with most of these books they can't really be compared to canon. I promised myself I wouldn't waste anymore time with 3 star books, but this one didn't become 3-star worthy until the climax. Up until then, I thoroughly enjoyed the plot and even got creeped out a few times. Sam and Dean had dialogues and thoughts much like the characters on the TV show. However, the writing wasn't great; strange punctuation combined with sentence fragments meant occasionally I'd have to reread a sentence to see if it actually made sense. (It made sense about 2/3 of the time. )The climax is my main reason for giving this book 3 stars. Sam and Dean are about bloody fights— action and movement. This climax was basically a psychic battle; if it were an episode on TV, everyone would be standing still and staring intently.Overall, it's an okay book. The bad guy wasn't immediately obvious and there were some creepy moments. It's a decent read for when you need something light. That was so good!!!! I really love the supernatural book series. especially this author because he always leaves supernatural playlists with the books. Yes please. that has introduced me to soooo many good new (old) songs and tbh I feel so much more cultured. so thanks for that. I also love how there are just a ton of gay couples even if they're not all main characters. it is awesome because it shows diversity. I am also in love with the accuracy of the portrayals of sam and dean's characters. and even bobby's. I LOOOOVEEEE how I can hear their voices in my head when I'm reading their dialog. it is thrilling. Time to read the next one!!! 10000/10 will always come back for more. you will not catch me ever hating on these books they are that good.